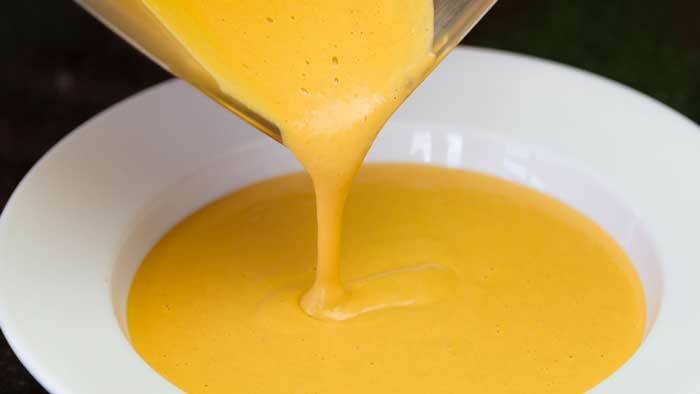 This quick and easy no oil vegan cheese sauce recipe is rich, creamy and full of flavor! Best of all it is totally plant based with no cholesterol. 1 whole Red Pepper Roasted & marinated in brine. The main thing you will need for this recipe is a blender. Add all the ingredients to the blender and blend for 1-2 minutes and it's ready to serve. This sauce is really versatile. It's ideal for nachos, lasagne, pasta sauces and pretty much anywhere you need a cheese sauce! Can you make a nutloaf that is tasty without using legiumes that my husband hates. I have never found a really nice way to use beans or lentils. Any suggestions.? WOW! Great recipe. Can’t wait to try this. Thanks for sharing!!! I am new to this kind of eating/cooking, and wondered how long this sauce will keep in the fridge? What was the resulting quantity of this awesome sauce? A guestimate measure in litres or cups would be great! Cheers! Your Potatoe Lasagne is a favorite dish at home. The first time I tried my kids could not believe it was fully vegan! I love your easy recipes. Where is this Potato Lasagna recipe? This looks amazing! I cant have any fats right now. Is there something i could use in place of the Tahini? Hummus or maybe a bit of miso paste. I prefer not to use oats. Can I substitute quinoa flakes or some other non-grain? Thank you. You could use some cooked quinoa. If we used cooked quinoa instead of oats, is it a one-to-one substitution? You can use it either way 🙂 Glad it worked for you Elaine. Thanks Anja. It was delicious and even my husband liked it despite moaning beforehand that he’d prefer a proper cheese sauce! Thanks for sharing all your recipes. They are just so wonderful and best of all they are based on the Starch Solution way of eating. I love watching all your videos. They are so well produced and your professional looking and user friendly website. The best feature is the printer version of the recipes come with a photo of the dish. Thanks a million. I would love it if you stated how long you can store recipes in the fridge and or freezer. Thank! I love love love your recipes! About 1 week in the fridge or you can freeze it also. Would cooked frozen cauliflower work? I have a few bags in my freezer that need to be eaten. I am enjoying looking at your recipes. Thank you for all of the time and effort you are putting into making such yummy looking food. I am looking forward to making many of the recipes. It might be a bit too watery. You would have to test a batch and see. I finally got around to making this and now I can’t stop tasting it – right from the spoon. I cut the white pepper to 1/4 tsp because sometimes it gives me problems and now the recipe is perfect! Where do you find miso in the grocery store ? Thanks for your reciepes. Usually with the asian goods. I have made this recipe a few times now and love it! Thank you! Tried this with friends to dip our home made corn tortilla chips since my friend is on a low sodium diet. We replaced most of the salt content with low sodium alternatives or no-salt for ours. It was actually pretty good. Doesn’t taste “cheesy” per say… if anything the pepper mostly came through, but the longer you spending eating it, it does develop a cheese like after flavor. Hello! I made this last night to use with my veggie lasagna and it was a big hit; the biggest was our 16 year old son! (he licked the blender clean lol) Tried other recipes and no one liked any until this one! Today I made another batch to store in the fridge for when I need cheese. Next to try is your hard cheese. Can’t wait. Thank you for sharing your cooking talent with everyone! Have a wonderful day! Hi Wendy, so glad you and your son like my recipe so much! Hello, I have a question and apologies beforehand for it seeming an oxymoron of a question. Is the nutritional yeast absolutely vital to achieving the cheesy flavour? Allergic to it, many thanks sent to you across the miles. Just use miso paste and tahini instead. Can’t use any nut milk or rice or soy or coconut milk . Is there other way to make this ? Mine turned out much more runny than yours, put right amounts in and it tastes good. How would you thicken? I think you nailed it. It’s the best vegan cheese sauce out there. Recently, I have given up dairy, sadly missing the cheese. Happily I will be enjoying one of my favorite dishes tonight being Mac and Cheese. Thank you so much for all your hard work. I enjoy your videos and am encouraged to stay on course. Hi! Made this for the first time . . . the flavor is fine . . . it turned out a bit thinner than preferred; what would you advise to thicken it a bit? Thanks much!!!! Maybe use some cornstarch and heat to thicken. Hello. I can’t find miso paste. Is there a good substitute? Tahini and a bit of soy sauce mixed together. Thank you so much for your amazing recipes!!! I am going to make the sauce and use drizzled over my crepes which will be stuffed with mushrooms and onions. I am serving it for company at a brunch. Sounds like a perfect combination!!! Im enjoying your recipes, thank”s for sharing your delicious recipes. But i have a question can I substitute the miso in the recipe above? Just leave it out or add a mixture of tahini and soy sauce. Hello Anja! I found your site today while searching for a good oil-free, dairy-free cole slaw recipe… not only did I find a great cole slaw recipe, I am finding so many others!! Husband and I have been plant-based for about a year and a half and are loving it.. thank you for all of your great recipes and videos!!! Can’t wait to try them all! This “cheese” sauce is outstandingly good. It tastes like it should be soooo bad for you, but is clearly very nutritious with not one “sinful” ingredient in it. After reading the comments, I reduced the water to 1 cup and was very happy with the consistency. Will also use less salt next time as we found it a little salty for our palates. You have to try it folks – an absolute winner. Thank you so much Anja. Thank you so much for your wonderful feedback… I’m glad you like the recipe as much as I do. So glad you like it 🙂 Yes it can be frozen. Is this the same recipe Chef AJ used in her video? She put it in a mold and then cut for cheese and crackers. Can this Recipe be made without the oats or is there another substitute that you would recommend? Do you know if this freezes well? I’d like to make it and save some for later. Love this cheese sauce! It’s become my go-to sauce to pour over everything. I just made a double batch and froze half of it. The only thing I’ve done differently is used fresh raw red peppers instead of roasted just out of laziness. It turns out really well. Looks wonderful, but I have a family member with Crohn’s disease so try to avoid nutritional yeast – any suggestions for substitutions? Leave it out. Or use a mixture of tahini and soy sauce. Quick and easy but one of the ingredients is a roasted red pepper marinated in brine? How does one quickly obtain that? How long roasted? Take the peel off? How long do you marinate it? What does the brine consist of? That is a seriously confusing ingredient!!! It is store bought in a jar. Peppers and I don’t get along at all. Any ideas what to use in place of the red pepper? Pickled eggplant might work. Or sweet potato and a splash of vinegar. This is better than real cheese! I am in cheese heaven thank you thank you thank you!!! Nutritional yeast has the same base ingredients as MSG, which in some people cause headaches. Can you suggest a substitute? Just leave it out or use some tahini and a splash of soy sauce instead.